Forecast by the Meteorological and Geophysical Agency of Indonesia has forecast that the rainy season in Bali will be started in early November this year. The rainy season is expected to last very long. because Bali has a very long drought, resulting hinga rice fields in Bali drought and crop failure. The rainy season in Bali will soon arrive in November this year. Then the threat of flooding in major cities in Bali has threatened residents and transportation. Floods are common in Bali. Not only in big cities, also in real rural population of not much. Floods in Bali is most common in densely populated areas. The characteristics of the rain will occur in November of this is the increasing temperature of the day-to day. Increased air temperature occurred on day and night. Not because the sun or global warming, but because of the greenhouse effect caused by thickening of the clouds in the sky, so that the hot air that normally would penetrate the space into space, will be reflected back to earth, so the earth confined by hot air. Even in several locations in Bali had started to rain, though tida heavy, but quite wet soil and dust precipitate. Dust during the dry season is very common. Cars passing on the road during the dry season, most of the car body is covered by dust. Dry ground resulting in dust more easily formed, no rain, no water. The rainy season will start to happen in November. Can be ascertained at the end of Bali will be heavy rain. 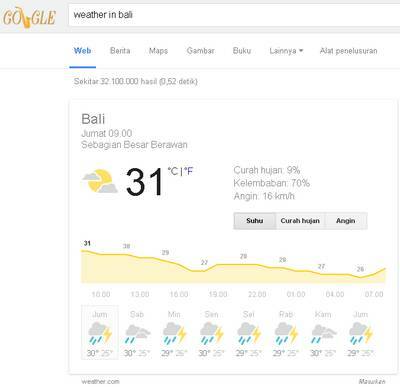 Rain will occur in almost all areas in Bali. New Year's celebrations are likely to be exposed to rain. The new year is always rains in Bali. But this year there will be very heavy rain. So that the celebration of the new year may be disrupted by rain. Holiday in Bali was time ends. Because of the dry season as the season for holidays in tropical countries is typical. If rain occurs, then the tourist activities in Bali will be disrupted. Because tourism activities in Bali are mostly done outdoors. When the rain will occur in November, then almost all the beaches in Bali will be filled with garbage. Trash on the beach from the river that empties into the beach. When it rains the river in Bali carrying garbage from the mountain of leaves and wood, plastic waste from residential areas around the river, and carry wastewater from the city, so the beaches around the river will be polluted and dirty.